The real birthday celebration is happening at the end of the month with family hanging out and whale watching. My friend recently went to San Diego whale watching and said it was amazing, so that was all the persuasion we needed. However, I wanted her to see her present today…. well part of her present since it is going to be framed. They have some great designs and it was very hard to choose. I just loved the whimsy of this one and I thought it kind of worked with the whale watching. 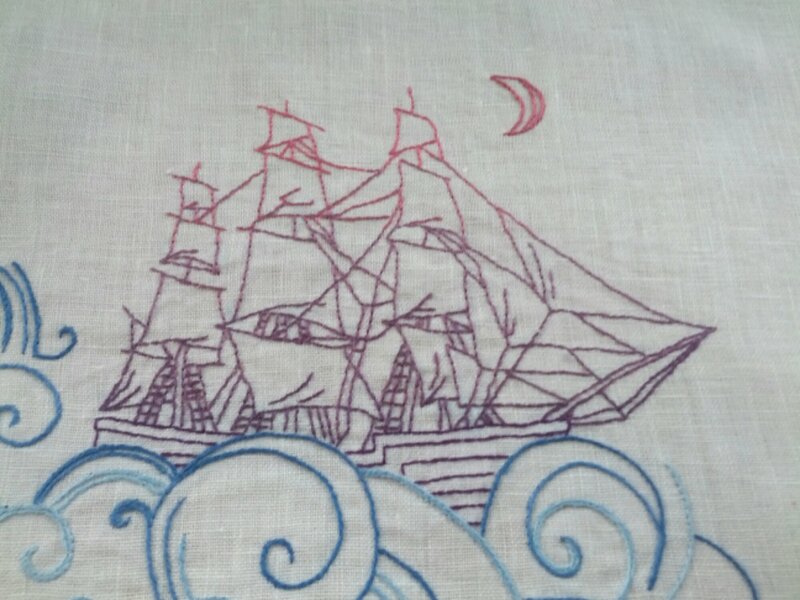 The ship is done in back stitch. I wanted it to have a different look than the water. 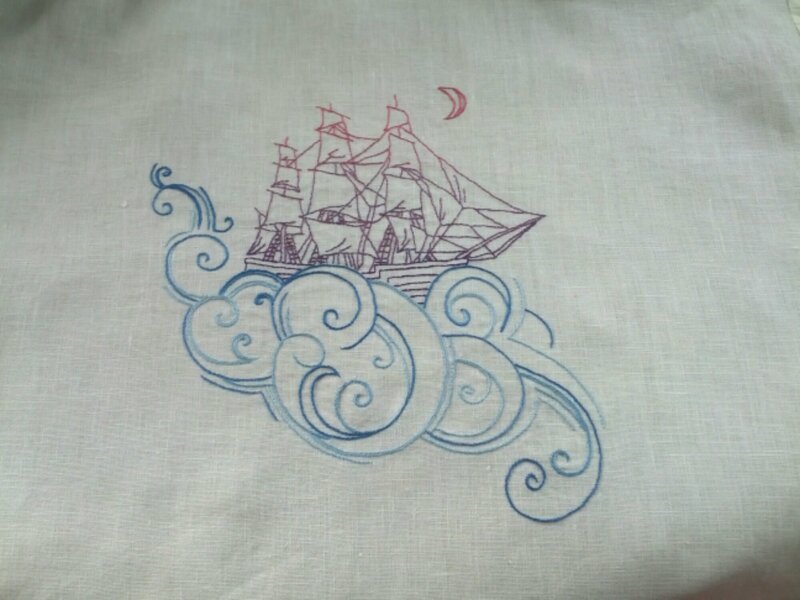 It is completed using four different thread colors that are put together in different combinations as you go down. I was at a loss of how I was going smoothly transition these colors. At the perfect time a blog I love to follow, Needle’ n Thread www.needlenthread.com , had a post that involved the technique of tweeding or blending two different colors to make a new color. Yes! I had the solution! BTW Mary Corbet’s Needle ‘n Thread site is a FABULOUS place to watch tutorials on different stitches. There are basic and advanced stitches. Even though the projects she does are much more advanced than I am ready for I love that I can be inspired and learn. 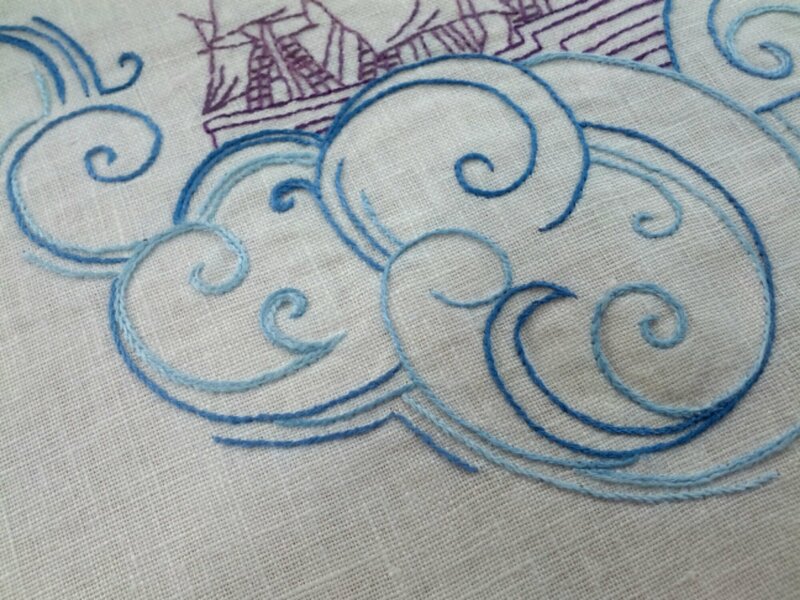 The waves I completed in stem stitch to make them have a more flowing look. I also used four colors to create interest. Some wave lines I made thicker to create dimension. Of course it’s not perfect because I am a beginner but I was really happy about how it turned out. Happy Birthday Mom! I love you! Praying you have a beautiful blessed day. And don’t worry about that 60 number. What a blessing to be granted 60 years! and many more to come! 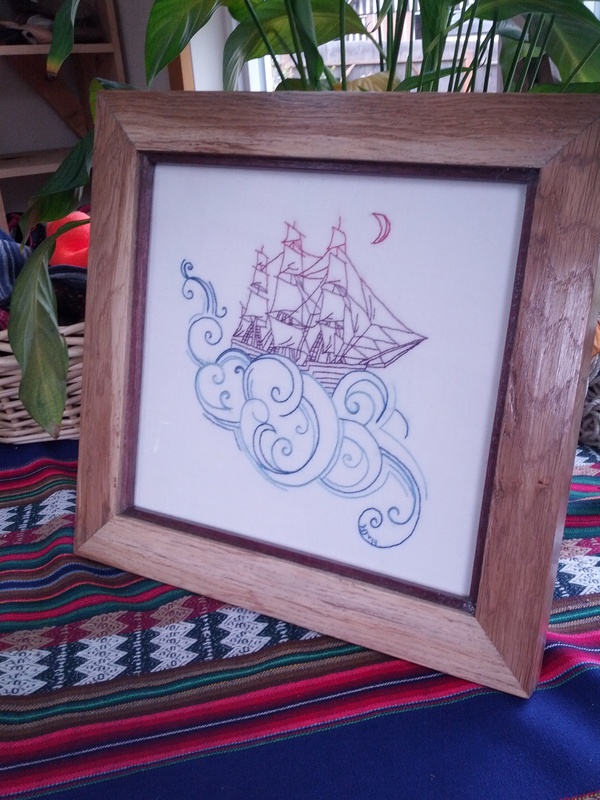 Here is a picture of the completed and framed piece in The Screwy Carpenter’s custom frame. It is Oak and trimmed on the inside with Purple Heart. It turned out beautiful! A nearby glass company cut me a out a custom piece of glass for a nice low price. I love it and Mom loved it too. 🙂 Next time I frame one (now that I have some experience) I will show you the technique I used.